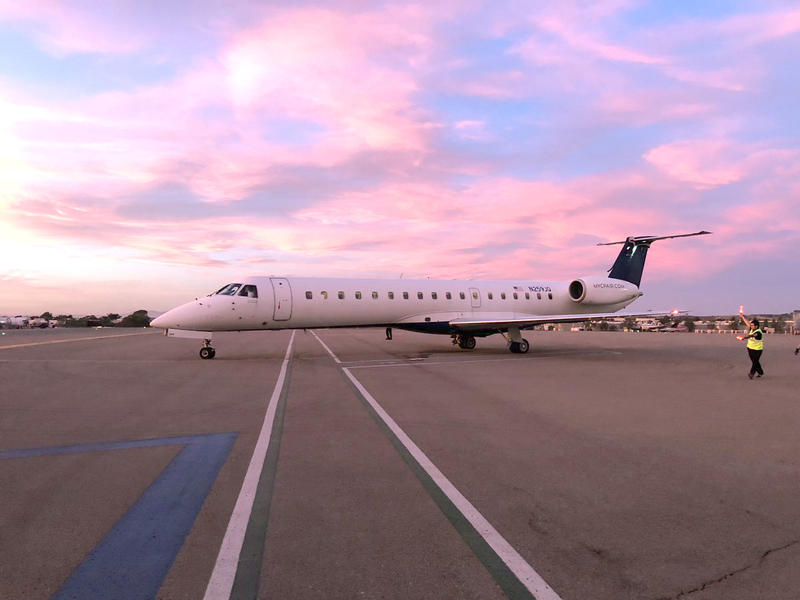 CARLSBAD — Early success is leading to further expansion for California Pacific Airlines. On March 1, the airline will begin nonstop service to Sacramento followed by a March 15 launch to Denver, according to a press release from the company on Nov. 27. Also on March 15, CP Air will begin two daily nonstop flights to Reno from McClellan-Palomar Airport in Carlsbad. The new routes come off the heels of CP Air launching commercial service on Nov. 1 to San Jose and Reno. On Nov. 15, the airline began service to Las Vegas and Phoenix. As for the new cities, CP Air will service Sacramento International Airport and Denver International Airport, according to Tom Morrow, CP Air’s director of communications. As for fares, Morrow said those will be announced at a later date. The flight to Denver, though, will include a layover in Phoenix. In addition, CP Air will also expand its fleet of Embraer 145s, a 50-seat jet currently in service. “We’re expecting two additional Embraer 145 aircraft to be added soon to our fleet,” CEO Ted Vallas said. “We’re anticipating adding a larger Embraer 170 sometime in early 2019. Currently, all of CP Air’s western division operations originate out of Carlsbad. Vallas, 97, began building the new airline nine years ago. In the 1980s, he owned and operated Air Resorts, a seven-plane airline operating out of San Diego. Chief Financial Officer John Barkley said earlier this month the airline is seeing a “dramatic uptick” in ticket sales after the airline finally took flight. Another bonus, he said, was holiday flights were starting to fill quickly. It was coincidental timing, though, that CP Air started service just weeks before Thanksgiving and Christmas. Regardless, the airline’s main competitive advantage is prices similar from San Diego and less travel and hassle to fly. CP Air was the second commercial airline to operate out of McClellan-Palomar Airport this year. Cal Jet Elite Air launched operations last year, but shut down in April. Cal Jet Elite Air announced it would return in June with more routes, but has not returned to service. CP Air is the only commercial option in North County for the foreseeable future. Fares range between $99 to Las Vegas and San Jose and $148.99 to Reno. The airline offers both refundable and nonrefundable tickets with the nonrefundable tickets being less expensive. Disclosure: The Coast News owner Jim Kydd is an investor in CP Air. LCC / ULCC ops with an Emb 145? Quicky quiz: Name one LCC / ULCC airline on planet earth that has been able to make the model work with the Emb 145. It doesn’t take a rocket scientist to figure out where this is headed. I’ll give it ’till early Feb. I don’t think this airline will make it since they’ve had way too many cancellations after only one month of operations. Their one and only plane, operating in California, has been out of service since Monday and all of their flights have been cancelled. I hope Jim Kydd doesn’t lose his shirt. I’d love to see an article in Coast News about this – they’ve really put a lot of people in a bind, simply checkout their reviews on Facebook or their list of cancelled flights. It’s a great news as for me.